1 1/2” Spidertrax Wheel Spacers use a 5 on 5″ bolt pattern and are made from 6061T6 aluminum. They will widen the track of the Jeep Wrangler’s axles and provide additional room to flex the suspension while off-road. The kit comes with 2 wheel spacers, 10 standard wheel studs (pre-installed), 10 lug nuts, and a tube of red loc-tite. I purchased a kit for the front and rear axles. Anodized aluminum provides corrosion resistance and the dark blue looks cool. Each Spidertrax wheel spacer is wheel and hub centric for a perfect fit. When installing the spacers, apply a dab of red loc-tite to the inside threads of the 5 lug nuts. Use a 19mm socket, tighten all 5 lug nuts in a star pattern to 95 ft. lbs. of torque. It helps to have a friend step on the brake to keep the wheel from spinning as you torque the lug nuts. After 100 miles it’s important to check to make sure everything is still tight. The 1 1/2″ spacer makes the outside of the tire flush with the fender flare. I know some people are opposed to spacers, but Spidertrax’s are very well made and they have a great reputation. I plan of checking the lug nuts every oil change (3,000 miles) and tire rotations (10,000 miles). 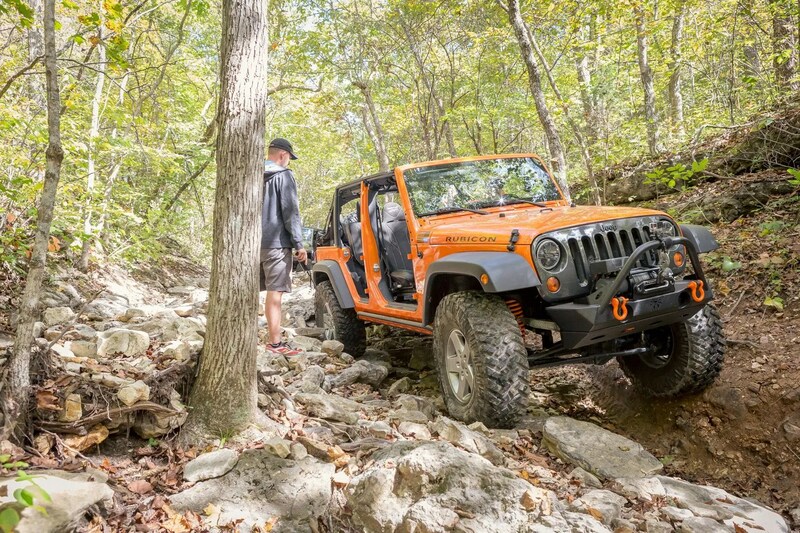 When I upgraded to 37″ tires, the Spidertrax wheel spacers allowed me to keep my stock wheels. Personally, I like the look of the Rubicon wheels and the spacers prevent my new tires from rubbing the inner fenders wells. Some Jeepers will tell you that high quality spacers are expensive ($200ish a set) and for just a little more money you can install properly backspaced 17″wheels that fit the stock tires. While that is true, those aren’t the wheels I like. By keeping my stock rims my Jeep maintains a low key look and I get to keep the wheels I wanted so badly on past (non-Rubicon) Jeeps. At some point in the future, I’ll upgrade my Jeep’s wheels and choose the proper backspacing. At that point, these Spidertrax wheel spacers won’t be necessary, but they have extended the life of my factory rims as my Jeep grows up. To me, that is worth it.